This is at the New School, 63 5th Ave. My panel, on social media and online media, is at 11:15 a.m. The schedule and registration information are here. Jonathan Marks (Penn State). The Perils of Partnership: Industry Influence, Institutional Integrity & Public Health (Oxford University Press). Mitchel Cohen (Independent). The Politics of Pesticides: The Fight Against Monsanto’s Roundup. (Skyhorse Publishing). This is from 3-5 p.m., Furman Hall (245 Sullivan Street, between Washington Square South & W 3rd St), Room 315. For more information, click here. I’m joining food historians Jane Ziegelman and Andrew Coe for the last session of their “Serious Side of Reading” series in connection with the exhibit on “Feeding the City: The Unpublished WPA Federal Writers’ Project Manuscript.” This is at 5:30 p.m. at the NYC Department of Records and Information Services , 31 Chambers Street, Rebecca Rankin Reading Room, Suite 111. RSVP here. This will be at the annual Congress. My talk, on “How food companies skew the science of what we eat,” will be from 11:30 to 12:00 at the Grand Auditorium of Culturegest Lisboa. This is a brown bag lunch conversation with Laura Schmidt on food, nutrition, and politics. It’s at noon in the Lange Room, UCSF Library 5th FLoor, 530 Parnassus. More information is here. This is a conversation with Paul Greenberg on “Food Fights: Covering Disputed Science About Food and Nutrition.” It’s 6:00 to 8:00 p.m., Arthur L. Carter Journalism Institute, 7th Floor Commons, 20 Cooper Square. More information is here. It will be live webcast online at 6:30 at journalism.nyu.edu/kc. Greenberg’s latest book is The Omega Principle. I’m speaking about Unsavory Truth at 6:00 p.m. Pfizer Auditorium in a conversation with Beth Noveck. The school is at 5 MetroTech Center (North side of MetroTech Commons). Another book talk, this time at the Harvard Club, 27 West 44th Street, 7:00 to 8:00 p.m., followed by book signing. This is a book talk at this College, at its President’s home, 6:00 p.m.
My daughter Rebecca is Cultural Program Manager at Grace Cathedral where she manages, among other things, the Sunday morning Forum on Faith, Ethics, and Culture. I’m doing a talk on Unsavory Truth at 9:30 a.m. Details here. From 10:30-11:15, I’m doing a conversation with Real Food Media’s Tiffany Patton about Unsavory Truth (and other matters) under the auspices of CUESA (Center for Urban Education about Sustainable Agriculture), in the CUESA Classroom Tent in front of the Ferry Building, followed by a book signing at Book Passage inside the Ferry Building. I’m speaking about Unsavory Truth at the Sharon Heights Country Club, 2900 Sandhill Road, from 11-1. For information and registration, click here. I’m keynoting a conference to launch the UCSF Library’s new Food Documents Collection, which houses documents I used in my research, among others. It’s a morning conference, 8:30-12:00, at UCSF’s Laurel Heights Auditorium, 3333 California St. Suite 265. Details about the other panelists and the conference are here. My session is from 1:00 to 2:30. It is called “Hot Off The Presses! Getting the Message Out with Public Health Authors.” Moderator is Joyce Gaufin, co-editor of the book “Mastering Public Health: Essential Skills for Effective Practice.” Other panelists are Mona Hanna-Attisha, author of What the Eyes Don’t See: A Story of Crisis, Resistance, and Hope In An American City, and Sandro Galea, author of Healthier: Fifty Thoughts on the Foundations of Population Health. After the session, the three of us will do a book signing in the APHA Press booth at the exhibit center. Details about the APHA schedule are here. I’m speaking about conflicts of interest at the Johns Hopkins’ Choose Food Symposium, November 5-8, Renaissance Harborplace Hotel. The program is here. Registration is here. My talk is at 11:15. This will be a conversation about Unsavory Truth with Roni Caryn Rabin, who wrote the terrific series of New York Times articles on the alcohol industry’s aborted effort to fund an NIH study of the benefits of alcohol consumption, 7:30-8:30 p.m. For information and tickets, click here. This is a conversation with Ji Suk Yi about my new book at International House, Assembly Hall, 1414 East 59th Street, at 10:30 a.m. Information about the Chicago Humanities Festival is here. Information about my appearance is here. This is a talk and book-signing for Unsavory Truth: How the Food Industry Skews the Science of What We Eat (Basic Books, October 30). 7:00 p.m. at Politics and Prose, 5015 Connecticut Ave NW. Information is here. This is the publication day for Unsavory Truth: How Food Companies Skew the Science of What We Eat. I will be speaking at 5:00 at NYU’s Fales Library, 3rd Floor (Washington Square South at La Guardia Place). My brief talk will be followed by a Q and A and a reception. Come celebrate with me! I’m doing a conversation with the director of Heritage Radio (and a graduate of our program) Caity Moseman Wadler. We will be discussing “Food Policy Then and Now.” from 10-11 a.m. Information is here. I am the honored to be the recipient of this group’s Grande Dame award, at its annual conference reception and dinner. Renaissance Hotel, 515 Madison, 6:30 p.m. This is a lecture for the Lee Honors College’s Lyceum Lecture Series on “Food for All: Sustainable Practices, Community Access, and Nutrition.” The lecture is at 6:30 p.m. followed by a reception. Chenery Auditorium, 714 South Westnedge Ave.
I’m giving two talks today, both open to the public and free. Information is here. Noon: I am giving Grand Rounds on “Food Politics: Diet and Cancer Prevention,” Concord Hospital Family Health Center, 250 Pleasant St.
6:30 p.m.: I am speaking on “Food Politics: Food Industry Influences on Diet and Health,” at Concord City Auditorium, 2 Prince St. A book signing will follow. This will be a 15-minute preview of my forthcoming (October 30) book, Unsavory Truth: How Food Companies Skew the Science of What We Eat, 10:20 a.m., large conference room, 411 Lafayette, 5th Floor. This will be a conversation with former FDA Commissioner David Kessler and other speakers about how diet-related chronic diseases are driving up heath care costs. Washington Post Live, program called Health 202 Live, 3:30 to 5:00 p.m., 1301 K St. NW. Information about the event and the other speakers is here. To register, click here. I’m speaking at the 3rd annual conference on “Dietary and Lifestyle Strategies for Cardiovascular Risk Reduction.” I’m giving the closing talk at 12:40 p.m. on “Food Politics: Overcoming the Barriers to Healthy Diets.” This is at Langone Medical Center at Alumni Hall 550 1st Ave.
I’m speaking to a class at Cornell at 11:15 a.m., 100 Savage Hall. This is the third event this week celebrating my career. The panelists are Florence Fabricant New York Times Columnist Author Tia Keenan; Writer, Activist, Cheese Expert; Alicia Kennedy Village Voice Contributor; Kat Kinsman Writer, Editor, Speaker; Korsha Wilson Writer, Heritage Radio Host, Former Restaurant Worker. The Moderator is Clark Wolf Food & Restaurant Consultant. This is the second event this week celebrating my career. Panelists include Marian Burros, formerly of the New York Times, Shawn Goldrick, Director of Patient Support Services, Boston Children’s, Danielle Nierenberg of Food Tank, Gustavo Setrini in my NYU department, and Katy Sparks, sustainable chef. Moderator is professor Sapna Parikh, visual storyteller. I’m part of a panel on “Vegan America: Race, Food, and Politics,” at 6:00 p.m. at 20 Cooper Square, Fifth Floor. Other panelists are David Carter (Founder, 300 Pound Vegan; Retired NFL Defensive Lineman), Syl Ko (Co-Author, APHRO-ISM: Essays on Pop Culture, Feminism, and Black Veganism from Two Sisters), and Renan Larue (Assistant Professor of French Literature, UC Santa Barbara). I’m speaking at the Tinkham Veale University Center Ballroom, 11138 Bellflower Road on “Food Politics in 2018: A Humanities Perspective.” The event is sponsored by the Baker-Nord Center for the Humanities as part of the Cleveland Humanities Festival. My talk is at 4:30 p.m. This is part of UC Berkeley’s Edible Education series run by Alice Waters and Will Rosenzweig. 6:00 to 8:00 p.m., Anderson Auditorium, Haas School of Business. This is the UC Berkeley School of Public Health’s 75th anniversary Dean’s Speaker Series, cosponsored by the Berkeley Food Institute. It’s a conversation with Alice Waters, at 5:00 p.m. in the David Brower Center, followed by a reception at 7:00. Details here. This is a one-day meeting on the Future of Food. It’s at the PACIFICO Yokohama, Conference Center Main hall / 301 / 302. Admission is free. Talks are in English or with simultaneous translation. I’m speaking on two panels—one on obesity and the other on healthier lives—in the afternoon. The other panelists are here. The schedule should be posted soon. I’m giving the keynote to the Notah Begay III Foundation on the impact of sugar-sweetened beverages on families in Native American communities. The meeting begins at 8:30 a.m. My talk is at 9:30. The conference is at the Hotel Albuquerque, 800 Rio Grande Blvd, NW. Information about the conference is here. I”m keynoting a conference sponsored by this center at De Nieuwe Kerk. The conference starts at 1:30 and my talk is at 2:05 on “The food environment: the importance of food literacy.” The conference, which also features Helen Vidgen and Jaap Seidell, is free. Information is here. I’m on a panel on CRISPR, GMO, or No: Genetics’ Role in the Food Supply moderated by Ariel Lauren Wilson, editor Edible Manhattan and Edible Brooklyn. Fellow panelists: Sam Kass (former Let’s Move chief) and Louisa Burwood-Taylor, AgFunder. The panel is at 11:30 a.m. at Industry City, 274 36th Street (Subway D, N, R @36th Street). Information, schedule, and tickets here. I’m giving a talk on my forthcoming (probably not for a year) book, “Buying nutrition science: How food industry sponsorship skews research and harms public health,” at a WHO nutrition seminar, 12:30 – 13:30, Library Meeting Room. I’m speaking at 10:45 on our changing relationship with food. Details here. I’m moderating a panel in conjunction with the UN High Level Political Forum exploring policies to prevent obesity. The panel is on “bold actions, bold outcomes: protecting and promoting healthy food environments in the SDGs [Sustainable Develoment Goals]. 6:15-7:30 pm, Conference Room B, UN Headquarters. Information is here. I’m on this panel: History of Nutrition Forum: History of the Dietary Guidelines for Americans, 8:00 AM ̶ 10:00 AM, McCormick Place Convention Center, S105A. Chairs: Lisa Jahns, PhD, and Forrest Nielsen, PhD, USDA-ARS Grand Forks Human Nutrition Research Center, Grand Forks, ND. I’m on a panel in the Critical Topics Series at the Fales Library, 3rd Floor Bobst Library, 70 Washington Square South, 4:00 p.m. The panel is on “The Food Movement: Now What?” As usual, Clark Wolf presides. Here’s the panel info. I’m keynoting IC Sustainability Week at 7:00 p.m., Textor Hall 102. I’m giving a talk in the M.R. Bauer Colloquium Series in the Department of Biology and Neuroscience on “Food Politics: From Science to Advocacy.” It’s at 12:30 p.m. in Gerstenzang 121. Free and open to the public. I am giving the keynote talk–“Food Politics: Making it Work for Health Promotion.”–to the conference on the Art and Science of Health Promotion, in the morning session, 9:00 a.m. It’s at the Broadmoor, 1 Lake Ave. The lecture, “Food Politics and the Twenty-First Century Food Movement,” is at 4:10 p.m. in the Chevron Auditorium, International House. Free and open to public. I am speaking on a panel from 9:00 – 10:30 a.m. Auditorio Soberón: My talk is on Sugar sweetened beverages: politics, culture and health. Juan A. Rivera Dommarco, Moderador. El uso de instrumentos fiscales para incentivar comportamientos saludables: los casos de tabaco y bebidas azucaradas, Frank Chaloupka , Universidad de Illinois, and Efectos de los impuestos a las bebidas azucaradas y los alimentos no básicos con alta densidad energética, Arantxa Colchero , Instituto Nacional de Salud Pública. Information about the conference is at https://www.insp.mx/congisp2017/. The fourth in the series: “Research priorities in nutrition-related policies” 3:00 p.m. Aula Magna room. The third lecture in this series: Conflict of interest in nutrition research, programs. and healthy eating recommendations: how to identify and manage.” 3:00 p.m., Aula Magna room. The second seminar in this series: “Junk food and challenges to generate scientific evidence of their detrimental effects.” 3:00 p.m. , Aula Magna room. This is the first of a series of seminars I am giving as part of my Fulbright Award: “Sugar-sweetened beverages: health policies to reduce their intake.” 3:00 p.m. Aula Magna room. I am giving the morning keynote (9:30-10:30 a.m.) at the First Annual Better Food Movement Conference, launching Food Week 2017. My talk is “Food Politics: From Personal Responsibility to Social Responsibility.” Chapman Conference Center, Room 3210 Miami-Dade College Wolfson Campus, 300 NE 2nd Ave, Bldg 3. I’m doing a “Hub Session” titled “Ask About: Nutrition.” This is from 9:30 to 10:00 a.m. in the Health Hub, lower level (-1) of the Congress Centre. This is a dinner panel discussion from 8:00 to 10:00 p.m. on “healthy people, healthy planet,” Hotel Meierhof restaurant. The other participants are Sam Kass, Dean Ornish, and Shenggen Fan (of IFPRI). It’s chaired by Allison Aubrey of NPR News. I’m giving a talk on “healthy eating: from personal responsibility to politics” from 9;00-9:45 a.m in the Congress Centre, BetaZone. I will be introduced and interviewed by Dr. Jeffrey Drazen, editor of the New England Journal of Medicine. I’m on a panel on the history and future of food policy in New York City at the CUNY Graduate Center, 365 5th Avenue at 34th Street, Elebash Recital Hall, 7:00-8:30 p.m. The panel: Gergley Baics (Barnard) will speak about his new book, Feeding Gotham, exploring the deregulation of the city’s public food markets in the early 1800s. I will talk about the late Joy Santlofer’s recent release Food City: Four Centuries of Food-Making in New York (for which I wrote the Foreword), and Nick Freudenberg (CUNY Public Health) will discuss food policy issues facing the city. Mark Bittman is moderator. Co-sponsored by Wellness in the Schools and Green Bronx Machine. I’m participating in the 2016 Nobel Week Dialogue at a meeting titled “Your Plate, Our Planet: The Future of Food.” It takes place at the City Conference Center, Barnhusgatan 12-14, Stockholm, Sweden. Thie venue is the Tuzzy Consortium Library. This is sponsored by the Arctic Slope Native Association Diabetes Program. The talk is probably at 7:00 p.m.
I’m speaking for the Alaska Native Tribal Health Consortium’s Diabetes Conference, at 10:45 a.m. at the Captain Cook Hotel. I’m speaking briefly at a meeting at the Kennedy institute of the long-standing (this is the 23rd year) Private and Public, Scientific, Academic, and Consumer Food Policy Group. Time and topic to come. I’m giving a lunch talk on “Food Politics: Who Decides What You Eat?” to sociology undergraduates in the department’s conference room, room 4156 Puck Building (295 Lafayette, 4th floor) from 12:30-2:00 pm. Free, open to public. I’m speaking at a panel to launch the late Joy Santlofer’s Food City, for which I wrote the Foreword. This will be at the Museum of Food and Drink, 62 Bayard, Brooklyn. The panel also includes Joy’s husband, Jonathan Santlofer and Cindy Lobel. It begins at 6:30. A celebration of Food City, the book by the late Joy Santlofer, alumna and former adjunct, from 6:00-8:00 p.m. at NYU’s Torch Club, 18 Waverly Place. Brief remarks from Jennifer Berg and Jonathan Santlofer (and me). Free. I’m doing a panel discussion on The Politics of Food at the Smithsonian’s food history weekend. The panel will be moderated by Dan Charles of NPR. Warren Belasco and Adrian Miller are co-panelists. This will be at the National Museum of American History, Warner Brothers Theater. Time: 9:45 a.m. Registration: free. I will be participating in a roundtable discussion at a conference on “Agriculture: Exploring the Fields of Tomorrow,” sponsored by the agricultural investment firm, Unigrains. My panel, on Food: Leading the way to health., is at 4:30 p.m. at the College des Bernadins, 20 rue de Poissy. I’m speaking at the David L. Lawrence Convention Center in the morning. Details to come. I’m giving a talk about nutrition in public health for NYU public health nutrition and other students and interested parties. A panel will follow. This starts at noon. Kimball Hall (Greene @ Waverly) ground floor. I’m speaking at a fundraising dinner for the Food and Environment Reporting Network at 6:30 at Haven’s Kitchen, 109 West 17th Street (between 6th and 7th avenues). I’m chairing a session for the Terra Madre Forum at 4:30 at Torino Esposizioni, Corso Massimo D’Azeglio, Room Aula Viola. I’m participating in a panel with Corby Kummer and José Bové at this event. Carignano Theater on Piazza Carignano 6 . 2:00 p.m.
I’m doing a Behind the Plate interview from 6:30-8:30 p.m. at Foodstand, 115 5th Ave (between 18th and 19th), 6th floor. This is in partnership with the NYC Food Policy Center and Sweetgreen. Information about tickets is here. I will be giving the keynote address at this conference. My talk is at 3:00 p.m. on Soda Politics. The conference takes place at the Hotel Igeretxe, Lugar Muelle Ereaga, 3002, Getxo, Bizkaia (near Bilbao). This is at the second day of the conference on Sustainable Food Systems, sponsored by The Manna Center Program for Food Safety and Security at Tel Aviv University, the Israeli Forum for Sustainable Nutrition, and NYU’s Global Research Initiatives. The meeting is at Bar Shira Hall at Tel Aviv University (directions are here). The meeting is free. For information and registration, click here. I am being interviewed on stage by reporter Miki Haimovitch from 3:30 to 4:15 p.m. In preparation, I was interviewed by Haaretz (in Hebrew, click here). This is a conference on Sustainable Food Systems, sponsored by The Manna Center Program for Food Safety and Security at Tel Aviv University, the Israeli Forum for Sustainable Nutrition, and NYU’s Global Research Initiatives. My keynote talk is in the session on food ethics, policy, and politics at 11:20 a.m. The meeting is at Bar Shira Hall at Tel Aviv University (directions are here). The meeting is free. For information and registration, click here. I’m giving the graduation address at commencement, David Geffen Hall (formerly Avery Fisher) at Lincoln Center, 4:00 p.m. Here’s the press release. This is a talk for Preventive Medicine Grand Rounds: “Food Politics and Public Health: Dietary Guidelines, Sodas, and Conflicts of Interest. The lecture starts at noon. It’s at 17 East 102nd St, conference room D5-122 (5th floor, West side, CAM building). I’m greeting doctoral graduates on behalf of the faculty at the Skirball Center, 3:00 p.m.
Lecture at 5:00 p.m. on Soda Politics, followed by book signing. Conversation facilitated by Dean Laura Bronstein. University Downtown Center, Room 220. This is sponsored by the College of Community and Public Affairs Non-Credit Courses, Programs and Events > Institute for Multigenerational Studies. Lecture on Soda Politics at the Mann Library, seminar room 160, 4:00 p.m. Refreshments served and books available for purchase. For more information, visit http://mannlib.cornell.edu/events-exhibits. I’m on a panel with Julian Armstrong (author Made in Quebec) and Jeffrey Yoskowitz (Gefilte Manifesto), moderated by Clark Wolf on “Food Studies: 20 Years In: What Do We Know, What Can We Know, What Should We Know?” 4:00 p.m., Bobst Library, 3rd floor. I’m giving the keynote address at 12:30 p.m. to this event sponsored by Monmouth Medical Center and Barnabas Health: “The food revolution: the cost of cheap food.” It’s at the Ocean Place Spa and Resort, 1 Ocean Boulevard, Long Branch, and will be followed by Q and A and book signing. This is a panel discussion on urban agriculture with Nadia Johnson from Just Food. George Reis from NYU’s gardening program, and Mike Hollis from Serving the Underserved. The moderator is Natalie Petrulla. 7:00 p.m. in Eisner & Lubin auditorium, Kimmel Center, 4th floor. Free. This is a lecture on Soda Politics at the Colegio de Ingenieros Civiles, Camino Santa Teresa No. 187, Col. Parques del Pedregal Delegación Tlalpan, C.P. 14010 Mexico City. Access to the auditorium begins 5:45 pm (valet parking is available). Free and open to public, but click here for registration and information. The 2016 Chefs Collaborative Summit takes place April 10-12 at NYU. I’m on the keynote welcome panel at 8:30 a.m., along with Kim Severson of the New York Times and Sara Brito of Chefs Collaborative (see schedule). For ticket information see here. Keynote lecture as part of the Master of Public Health program’s event for National Public Health Week. 9:00 a.m., informal breakfast. 9:30 a.m., lecture followed by a book signing. Student Center Theater, Sondra and David S. Mack Student Center, North Campus. I’m doing Keynote Session #2 at the IACP annual conference, April 1-3. It’s at the Loews Hollywood Hotel, 1755 N Highland Ave in Hollywood (Phone: 323-856-1200). My panel is from 8:30-10:00 a.m. on “Good Food May Equal Good Health, But It’s Not a Simple Equation.” My fellow panelists include Ellie Krieger and Michael Greger, MD, FACLM. This is for the Marineau symposium on the Morality of Capitalism: Sustainable Agriculture Versus Industrial Agriculture, followed by a reception and book signing. My keynote lecture, “Taking on Big Soda (and Winning): Lessons for Advocates,” is at 7:00 p.m. in the Ponderosa Room, Nebraskan Student Union. I’m on a panel on Ethics, Advocacy, and Transparency in Food, from 5:30-7:30 p.m. 35 West 4th Street, room 1080. Other panelists are Gustavo Setrini, John Gershman, and Dale Johnson. Should be fun. It’s free. Come! Lecture and book signing, 7:30 p.m. in the Templeton Blackburn Alumni Memorial Auditorium. This is through The Kennedy Lecture Series. Admission is free; doors open at 6:30 p.m.
Charles Perkins Centre, University of Sydney, 6th Floor Conference room, noon. The title is “Food Politics: An Unexpected Career (and its Consequences). This is the Nicholas Catchlove Lecture, Sydney Ideas Festival, co-presented with the Charles Perkins Centre : “Soda Politics in the US: Lessons from the food movement.” It’s at 6:00-7:30 p.m. at the Charles Perkins Centre Auditorium, Johns Hopkins Drive, University of Sydney (see venue location). Free and open to all with online registration requested. For information and registration, click here. This is a public lecture sponsored by the Faculty of Veterinary and Medical Sciences on “Soda Politics: Food and Health Advocacy in Action, from 6:30 -7:30 p.m. It’s in MSD-B117 (Theatre) Building:Melbourne School of Design, Masson Road. For details, click here. The podcast and slides are here. I’m speaking on a panel at a conference on “Current and future priorities for food policy,” from 2-5 pm. at the Deakin University Burwood Corporate Centre. This is located at the Deakin University Burwood Rd Campus, 221 Burwood Hwy, Burwood. The corporate centre is, on level 2 of Building BC (refer to map). For information and registration, click here. This is a talk on Soda Politics, 4:00 p.m., University of Sydney, Charles Perkins Centre, Level 6 seminar room. For information and reservations, click here. This is a noon seminar on Soda Politics for the School of Population Health at the University of Auckland’s Tamaki Campus, Building 730, Room 220. This is one of a series on Food Policy for Breakfast, moderated by Nicholas Freudenberg, Distinguished Professor of Public Health, CUNY School of Public Health and Hunter College, Faculty Director, NYC Food Policy Center at Hunter College. My seminar, on Soda Politics, will be at the CUNY School of Public Health, 7th Floor Auditorium, 55 West 125th Street, from 9:00 am – 10:30 am but arrive earlier for open networking. For more information, see the Food Policy Center website. This is a screening of Michael Pollan’s new documentary, “In Defense of Food” at NYU’s Skirball Center for Performing Arts, at 6:30. It’s followed by a panel discussion with me, Pollan, director michael Schwarz, and writer Ed Gray. Krishnendu Ray will moderate. Tickets are $15 for the general public and $10 for NYU students, faculty, staff, and alumni, and may be purchased online at nyuskirball.org or in person at the NYU Skirball Center Box Office: Tuesday-Saturday, 12–6 p.m. The NYU Skirball Center for the Performing Arts is located at 566 LaGuardia Place at Washington Square South. This group meets monthly to explore the science of food. I will be talking about the science and politics behind Soda Politics: Taking on Big Soda (and Winning), 5:30-7:30 p.m., location and registration details to come. I’m talking about Soda Politics at the NYU Bookstore, 726 Broadway (@ Waverly, just south of the Astor Place N, R subway stop). 6:00 p.m. Books will be available for signing. Here’s the flier for the event. This is a panel on the newly published Savoring Gotham. It’s titled Celebrating the Making of the Definitive Companion to New York City’s Food. The panel: Jennifer Schiff Berg, Hasia Diner, Krishnendu Ray, Meryl Rosofsky, Daniel Bowman Simon, and me, introduced by Cathy Kaufman. Registration starts at 6:30, the panel at 7:00. 411 Lafayette, 5th Floor. I am speaking about Soda Politics at a conference titled Make Real Change: Nutrition Educators as Advocates, from 9:00 AM – 12:00 PM (registration begins at 8:30 AM). My talk starts at 11:20 a.m. New School, Wollman Hall, 65 W 11th Street. My talk is titled “Soda Politics: Food and Health Advocacy in Action.” It is at 5:00 p.m. followed by a reception. Details to follow. I’m speaking about Soda Politics at noon. The moderator is Alice Huan-mei Chen, MD, MPH, Chief Medical Officer, San Francisco Health Network. The Commonwealth Club is at 555 Post St., San Francisco, 2nd floor. For information and tickets (free to members), click here. Book Passage is at 51 Tamal Vista Blvd. I’ll be talking about Soda Politics: Taking on Big Soda (and Winning), answering questions, and signing books. This starts at 7:00 p.m. Free and open to public. This is Soda Politics Book Launch: An Evening with Marion Nestle. Wednesday, November 4, 5:30 – 7pm, Goldman Theater, David Brower Center, 2150 Allston Way, Berkeley. Introduced by Marion Standish, Vice President, Enterprise Programs, The California Endowment.Free and open to the public. Registration highly recommended. Register here. I’m giving a talk on “How to Beat ‘Big Soda’ Companies,” 7:30 p.m., Town Hall, 1119 8th Ave, Great Hall. Tickets are $5. Doors open: 6:30 pm. Details and tickets here. The women’s food organization, Les Dames d’Escoffier, is sponsoring a panel discussion: The Next Big Bite: What You will Cook, Eat and Crave in 2016. It’s from 6:30 PM to 8:30 PM at the Institute of Culinary Education (ICE), 225 Liberty Street at Brookfield Place.. Doors open at 6:00 PM. The panel is moderated by Rozanne Gold, and includes Amanda Cohen, chef/owner, Dirt Candy; Amanda Hesser, co-founder/CEO, Food52; Mimi Sheraton, food critic and writer, and me. Admission is $65 ($35 for students); tickets are available at www.brownpapertickets.com/event/1887854. For further information, click here: www.ldny.org. Join the conversation at #TheNextBigBite. Copies of Marion Nestle’s Soda Politics: Taking on Big Soda (and Winning) will be available for purchase. Join the conversation by following @NewAmericaNYC and using #NANYC. Busboys & Poets is at 14th and V (flagship store), 2021 14th St, NW, in DC. I’m speaking about Soda Politics: Taking on Big Soda (and Winning) at 6:00 p.m., followed by Q and A and book signing. The event is free and open to the public. For more information, click here. This is the semi-official launch of Soda Politics: Taking on Big Soda (and Winning). I’ll talk at 5:00, followed by a Q and A and a book signing. The event is sponsored by the James Beard Foundation’s Enlightened Eaters program, the Natural Gourmet Institute (NGI) and Slow Food NYC . Fales is on the 3rd floor of the Bobst Library at NYU, 70 Washington Square South. 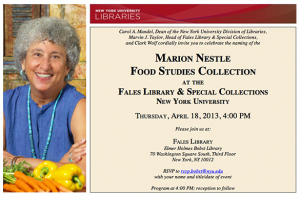 The event is free but donations to the food studies library collection are welcome. To RSVP or find more information about the event please visit: https://enlightenedeatersnestle.eventbrite.com. This is an all-day series of talks on food in Copley Square, 560 Boylston. I’m on from 1:10 to 2:10 on the Sweet Main Stage with chef Brian Mercury, Ricardo Salvador of Union of Concerned Scientists, and emcee Corby Kummer, talking about Soda Politics: Taking on Big Soda (and Winning). I’ll be in the author’s tent for the next hour signing books. I’m doing the first talk on Soda Politics at The Kitchen, 6 Congress Street, noon to 1:00. Brown bag lunch: Let’s Talk About Food. Free. Vanderbilt Hall (the law school), 40 Washington Square South. A reception will follow. Watch the Livestream. The other panelists are Steven Shapin, Franklin L. Ford Research Professor of the History of Science, Department of the History of Science, Harvard University and Gordon Shepherd, Professor of Neurobiology, Yale School of Medicine. The panel is moderated by Krishnendu Ray, Associate Professor of Food Studies, NYU Steinhardt. I’m sitting at a table chatting about my books at the National Archives’ traveling exhibit, What’s Cooking Uncle Sam, 2nd floor Rotunda, Alexander Hamilton U.S. Custom House building, One Bowling Green. Come keep me company. 12:00 – 2:00 p.m.
I’m speaking at the U.S. Pavilion from 4:00 to 5:00 on the terrace: Cooking Up Change—The American Food Movement. Admission is free once you are in the Expo. This is an informal discussion with people connected with GustoLab, an academic program on food and culture in Italy. I will be speaking on “Food Politics 2015: Issues and Controversies.” 10:30 a.m. The talk is for the doctoral program, Agrisystem, at the Universita’ Cattolica, Facolta’ di Agraria, Sala Convegni G. Piana, Via Emilia Parmense 89. For some bizarre reason, they have asked me to talk about “Is the Paleo diet healthy?”t For this audience, I would rather talk about agricultural policies, and will. I’m speaking on “What’s happening in the US: American Food and World’s Future Nutrition Challenges” at Circolo dei Lettori, Via Bogino, 9, at 18:30. Details here. This Summit is at UC Irvine on April 23 and 24. My keynote talk is “What to Eat: Sensible Food Choices in an Era of Dietary Confusion” at 10:00 a.m. for information, click here. I’m keynoting Virginia’s 4th Weight of the State conference on childhood obesity prevention, April 20-21, 2015, Hilton Richmond Hotel in Short Pump. Register here. My talk is at 3:30 p.m. This is the keynote 47th Annual Fred T. Foard Jr. Memorial Lecture at the Friday Center for Continuing Education (100 Friday Center Drive, Chapel Hill). It’s at 6:00 pm followed by a Reception and Book Signing. Free and open to the public. Register to attend here. Food has come to the forefront in the political debates in New York City. Issues ranging from food security to school food, from health to availability are the object of analysis and reflection, as the mayoral debate about food policy that took place at The New School in 2013 demonstrates. What is the future of food in the city? Who are the actors involved? What’s the role of civil society in determining what New Yorkers will have access to, and how? Grand Rounds on the Future of Public Health, Mailman School of Public Health: “Food Politics 2015: From Personal Responsibility to Policy Advocacy,” This is the opening talk in a month-long series of lectures on obesity prevention. 4:00-5:30 Alumni Auditorium, 650 West 168th Street. Free and open to the public. The conference is at the Arena Stage, 1101 Sixth Street, SW. Information is here. My on-stage interview is in the morning. This is an evening lecture/keynote on food politics at the McDougall’s Advanced Study Weekend, Flamingo Resort, 2777 4th Street, 7:00 p.m.
My presentation in the Hastings College Artists Lecture Series National is “Food Politics 2015: Beyond the Farm Bill.” It is at 7:30 p.m. in French Memorial Chapel and will be followed by a reception and book signing. I’m giving a lecture on “food politics in the age of health care reform” at 7:00 p.m., Banatao Auditorium, 310 Sutardja Dai Hall on the UC Berkeley campus, followed by Q and A. This is part of a lecture series sponsored by the Kaiser Permanente Institute for Health Policy for the joint master’s program in public health and journalism. Free and open to the public. This is part of a Monday night, 6:30-8:30, series of lectures on food and farming. Mine is titled “Linking Farm Policy to Health Policy in the Global Economy.” Garrison Sposito is speaking during the first hour. I will speak during the second hour. This is at the Sibley Auditorium (in the Bechtel engineering building) on the Berkeley Campus (free, but tickets required). This is the NY Times Food for Tomorrow conference. I’m speaking at 1:45 on healthy eating. I’m speaking at the annual food conference, details to come. Convene Conference Center 730 3rd Ave. This will be a public lecture with details to be arranged. I’m giving a talk on “Eat, Drink, Vote: What to Eat, What to Feed Your Kids, and How It Affects Your Community.” This is part of FoodSHIFT, a sustainable foodfest. It will be at the Center for the Arts at 5:00 pm. For details, click here. This is a keynote address to an event organized by Encumex at the Banamex Center Auditorium on “Food politics 2014: the implications of obesity for health policy, personal choice, and corporate responsibility. It’s at 9:00 a.m.
Panel discussion on GLOBAL FOOD: Over the Edge. The other panelists: Lester Brown, Robert L Paarlberg, and Frederick Kaufman. NOTE NEW VENUE: NYU Silver Center, Jurow Hall, 31 Washington Place, 7:00 p.m.
My lecture is sponsored by the McCoy Family Center for Ethics and Society: “Advocacy for Healthier Food Systems: From Clicks to Occupy.” 7:30 p.m. at Cubberley Auditorium. For more information, click here. This is followed by a session in José Andres’ course, “World on a Plate,” from 4:00 to 5:20 (I’m speaking on food politics and corporate responsibility with professor John Forrer), followed by a reception at the President’s House. 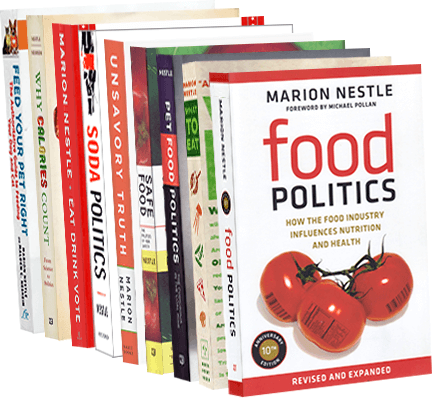 I’m speaking at the Department of Health and Nutrition Sciences at 6:00 p.m. on food politics, with a book signing to follow. It’s in University Hall Conference Center, 1 Normal Avenue in Montclair. Free and open to public. Cherry Bombe magazine is hosting a jubilee conference celebrating women in the world of food. It’s at the High Line hotel on 10th Ave and 21st street. My talk is on food politics at about 2:30 p.m.
I’ll be talking about–and showing pictures from—my book, Eat, Drink, Vote: An Illustrated Guide to Food Politics. Kimmel Center (Washington Square South), Eisner & Lubin auditorium, 6:30 p.m. Open to the public. For information, click here. My lecture starts at 7:00 p.m. followed by a book signing. It’s in the Orton Center on campus. Free and open to the public. I’m giving the TIAA-CREF Distinguished Lecture at 7:00 p.m. at the Center City Campus, 320 East 9th Street. Its title is “Food Politics: From Personal Responsibility to Policy Advocacy.” It’s followed by a book signing and reception and is open to the public. This is the rescheduling of the lecture I was supposed to give on October 10. The taxi driver went through red light at entrance to the Pulaski, was pulled over and found to be driving without a license. We never made it. The lecture is on food politics. It starts at 2:00 p.m.. Free and open to the public. The Newark Museum is at 49 Washington Street. This time, I’ll take the PATH. I’m giving the keynote address at this organization’s Real Food Innovator Awards Gala. NYU’s Department of Residential Life is showing the film A Place at the Table at 10:00 a.m. at the Palladium Residence Hall in the Multipurpose Room (3rd floor behind the cafeteria) at 140 East 14th Street. I’ll be speaking about the issues it raises after the showing. I’m doing a panel discussion to celebrate the release of Nick Freudenberg’s new book, Lethal but Legal: Corporations, Consumption, and Protecting Public Health. It’s at the Skylight Room, 9th Floor, CUNY Graduate Center, 365 5th Ave, 5:30-7:30 p.m. The other panelists are Nick Freudenberg and Laura Berry, director of the Interfaith Center on Corporate Responsibility. It’s free and open to the public but reservations are recommended. I’ll be talking about–and showing pictures from—my book, Eat, Drink, Vote: An Illustrated Guide to Food Politics. Kimmel Center (Washington Square South), Eisner & Lubin auditorium, 6:30 p.m. Open to the public. Because of snow, this is cancelled for tonight and postponed until March 25. New Directions in the Fight Against Hunger and Malnutrition: A Festschrift in Honor of Per Pinstrup-Andersen. Cornell University, Statler Hotel Amphitheater. The conference begins at 7:30 a.m. with breakfast and ends with a reception the following day with remarks by professor Pinstrup-Andersen at 2:25 p.m. For the schedule and details, click here. I’m going to do a talk (with slides) and sign copies of Eat Drink Vote, 6 to 8 p.m. The event is sponsored by CQ Roll Call and Hooks Books. It’s at Roll Call headquarters- 77 K Street NE, 8th floor. Public event. Register here. This is the 24th Annual University Club “Meet the Author Night and Book Fair” with lots of authors. University Club of DC- 1135 16th Street, NW, 5 to 8 p.m., open to public. I’ll be there for hours, so come by and say hello. I’m doing a reading and book signing of Eat, Drink, Vote for Politics and Prose (Washington, DC’s terrific bookstore). But it’s not at the bookstore. It’s at the MLK Library – 901 G St NW, 7 – 9 p.m., open to public and free. I’m doing a reading and signing of Eat, Drink, Vote at the NYU Bookstore, 746 Broadway @ Waverly, 6:00 p.m. Refreshments will be served. For details, click here. I’m giving the 27th Annual Fae Golden Kass lecture for women in the medical sciences. 4:00 p.m. This is at the Carl E. Walter Amphitheater, Tosteson Medical Education Center, 260 Longwood Avenue, Boston MA. Book Signing and Reception to follow. A reading and book signing of Eat, Drink, Vote, 6:00 p.m. 215 North Cayuga Street. Free. (phone 607 273 8246 for information. 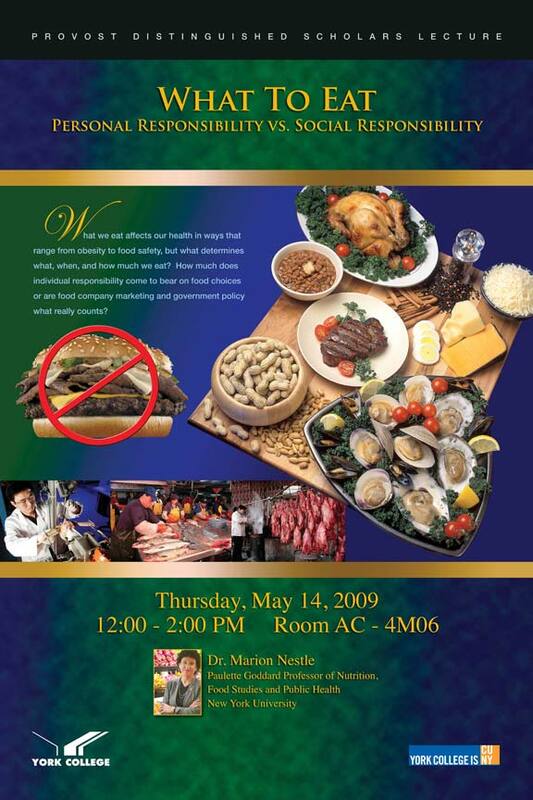 Lecture to students 4:00 p.m. on food politics and the industry’s responsibility for solving problems of obesity. This is a book signing for Eat, Drink, Vote at the annual meeting of the American Public Health Association, at the APHA Press booth #935 in exhibits at the Boston Convention and Exhibition Center, 415 Summer Street, Boston, at 4:00 p.m. This will be a presentation of Eat, Drink, Vote: An Illustrated Guide to Food Politics, published the day before. The talk is in the Enlighted Eaters series. It’s at noon at the James Beard House, 167 W 12th St. This is a discussion on the Future of Food. The idea of doing this arises from issues raised in Grasses of a Thousand Colors, a play by Wallace Shawn presented by the Theater for a New Audience at the Public Theater. The director is Shawn’s long-time collaborator and dinner partner, André Gregory. Wallace Shawn stars in the production, which also features actors Julie Hagerty Emily Cass McDonnell, and Jennifer Tilly. The discussion takes place after the Sunday matinee at about 5:30 p.m. I will be speaking with Elissa Altman, author of the critically-acclaimed memoir, Poor Man’s Feast: A Love Story of Comfort, Desire, and the Art of Simple Cooking (Chronicle 2013). I’m doing a conversation about Eat, Drink, Vote with cartoonists Jeff Danziger and Signe Wilkinson from 6:00 – 8:00 p.m. For information and tickets, click here. I’m doing a reading and signing of Eat, Drink, Vote: An Illustrated Guide to Food Politics, at Book Passage, 11:00 a.m.
Book Passage is at 51 Tamal Vista Blvd in Corte Madera. For further information, click here. Keynote on symposium theme: Nutrition from Science to Policy. Banatao Auditorium Sutardja Dai Hall, UC Berkeley, 9:10 a.m.
I’m appearing in a conversation with Narsai David, Food and Wine Editor, KCBS Radio, at 6:00 p.m. The Commonwealth Club is at 595 Market Street, 2nd Floor. Order tickets here. Lecture on “Food Politics: The Perfect Storm” in the Museum’s Generation Fit series. 6:30 – 7:30, followed by book signing. The Newark Museum is at 49 Washington Street. The event is free and open to the public. in American Life,” moderated by Clark Wolf. Other panelists are Matthew Derr, President, Sterling College; Kim Hastreiter, Paper Magazine; and Allen Salkin, Author, From Scratch: Inside the Food Network. The McElmurry Lectureship on the Ethics of Eating, 7:30 p.m. at Andrews U. Here’s student reporter Tim Huck’s take on it. Common hour talk to the Howard Hughes Medical Institute leadership academy for undergraduates, 11:30 a.m. Here’s a report. And here’s the video of the lecture. I’m doing a dialogue (Q and A) at 1:00 p.m. at the Four Seasons Hotel, Paseo de la Reforma No. 500, Col. Juárez. Open to public. Opening address to the 70th anniversary symposium on poverty, inequality, and welfare policies, 9:00 a.m.
Prolongacion Paseo de la Reforma 880 Lomas de Santa Fe, 01219 Mexico City, Federal District. Wednesday, September 4 is the launch of Eat, Drink, Vote: An Illustrated Guide to Food Politics. I will be signing books at the Union Square Greenmarket from noon to 1:30. Keynote talk on the conference theme, sponsored by the Rachel Carson Center for Environment and Society: Circulating Natures: Water, Food, Energy. Ludwig-Maximillian University, Geschwister-Scholl-Platz 1, 7:00 p.m. I am moderating a forum for candidates for Mayor of New York City at The New School’s Tishman auditorium, 66 West 12th Street. It runs from 6 – 8 p.m. (Doors open at 5 p.m.). The Forum is co-hosted by the Brooklyn Food Coalition, City Harvest, Food Bank For New York City, Food Chain Workers Alliance, Food Studies program at The New School for Public Engagement, Food Systems Network NYC, Hunger Action Network NYS, Just Food, New York City Coalition Against Hunger, New York City Food Policy Center at Hunter College, NRDC Action Fund, and Public Health Solutions. These are joined by about 70 partner organizations, and the list is growing. I get to ask the questions. What fun! The forum will be live streamed over the Internet. Click here for additional details. My lecture on the politics of food is at 5:30pm at the Yale University Art Gallery, 1111 Chapel Street. It’s free, no tickets required – just show up! Information about the two-week festival is here. This will be the closing keynote to the 7th Biennial Childhood Obesity Conference, sponsored by the California Department of Public Health, UC Berkeley, the Atkins Center for Weight and Health, the California Department of Education, Kaiser Permanente, and the California Endowment. It’s at about 11:30 a.m. in the Long Beach Convention Center. This is one of a series of lectures at The Well on Food, Faith, and Planet. Queen Anne United Methodist Church, 1606 5th Ave West, Seattle. My talk on the farm bill and SNAP is at 7:00 pm in the church sanctuary, followed by Q and A and a book signing. It requires tickets. Get them here. I’m participating in a panel discussion on “The Science of Food: From Geek to Chic” (not sure which category I’m supposed to be in) with Harold McGee, Anne McBride, and Maxime Bilet from 7:00 to 8:30 p.m. at the Institute of Culinary Education, 50 West 23rd Street. Food Politics: The Politics of Food, 10 Years Later. Panel discussion with Corby Kummer (The Atlantic), Maricel Presilla (restaurateur and author), and Katy Sparks, restaurateur. Hosted by Clark Wolf. I am participating in a Q and A during the Aquarium’s annual Sustainable Foods Institute. For information about this event, click here. I’m doing a panel on food systems at 10:30 a.m., followed by a book signing (the new expanded edition of Food Politics with a Foreword by Michael Pollan). I’m doing a panel at a conference on Living with Two Languages: The Advantages of Being Bilingual (which I, alas, am not). My panel is at 2:30. For information about the conference, click here. I’m giving a 7:00 p.m. lecture on how science and politics affect the food system, followed by Q and A and a book signing. It’s at Mess Hall, Capital U, 1 College and Main. Open to public. I’m on a panel at 4:00 to discuss a case study on Revolution Foods. Information about the Summit is here. This is the keynote to the annual meeting of Edible Communities Publications, the group that brings us Edible Brooklyn, Edible Finger Lakes, and more than 50 other Edible Magazines. My talk is at 9:00 a.m. I will be speaking from 12:30 to 2:00. Details to follow. I’m speaking on Why Calories Count in conjunction with the Lunch Hour exhibit. The lecture will be at 6:30 pm, on the 6th floor. The Library is at 455 5th Ave @ 40th street. Free and open to the public. This is a panel discussion moderated by Corby Kummer on “Can city food policies reduce disparities? Lessons from New York and London.” The other panelists are Sue Atkinson, the Joan H. Tisch distinguished fellow in public health at Hunter College and former director of public health London; Thomas Farley, Commissioner NYC Dept of Health and Mental Hygiene; and Derek Yach, Senior vice president, The Vitality Group. Reception 5:00 p.m. The program begins at 6:00 p.m. Attendance is free but RSVP required: 212-650-3174 or online. University lecture, Hendricks Hall, 7:30 p.m. This is a talk in the Food and Public Health series of the Center for Environmental Policy’s Bicentennial: “Food Issues in the US as connected to public health, the environment, and sustainability.” 6:30 p.m. Not sure yet about location. I’m speaking on “From Agriculture to Public Health: Personal Responsibility vs. Social Responsibility” at 6:00 p.m. in the Hilton Business Center (Hilton 100), 1 LMU Drive. A podcast is available here. This is the fall Kenan lecture: “Food Politics: How the Food Industry Influences Nutrition and Health.” 7:30 p.m., Haggin Auditorium, Mitchell Fine Arts Center. Free and open to the public. This one is “Food Politics: Personal vs. Social Responsibility” at 11:30 a.m. at Jazz at Lincoln Center, 60th and Broadway. Contact IIN for information. My talk is titled “Ethical Issues in Food & Nutrition.” It’s at 5 Washington Place, Auditorium Room 101, from 4:45-6:30 pm. Here’s one review of it. A talk on Why Calories Count: From Science to Politics, 4:00 p.m. Mann Library, Stern Seminar Room (Rm. 160). open to the public. The talk is on video on the Mann Library’s site and also on YouTube. My Distinguished Speaker lecture is “Kids, diets, and health: the politics of school food.” It’s at 3:30 p.m. in Beaver Run, CoppertopII. The lecture is online on the CASE website. My co-author Mal Nesheim and I will be speaking on Why Calories Count: From Science to Politics at 10:00 a.m., Salle D, 7th Floor, at WHO headquarters. Mal Nesheim and I are discussing Why Calories Count at City University’s Food Thinkers series at 4:00 p.m..
I’m giving the annual Distinguished Lecture on “The Politics of Food: The View from 2012,” 5.30 pm – 6.30 pm, at SOAS, Brunei Gallery Lecture Theatre, Russell Square, London WC1H 0XG. The lecture is open and free, but registration is necessary. RSVP: admin@lidc.bloomsbury.ac.uk. Combating Chronic Disease for Development’ organised by the Leverhulme Centre for Integrative Research on Agriculture and Health (LCIRAH) and London International Development Centre (LIDC). It can be attended as part of the workshop or separately. It will be followed by a drinks reception. I’m keynoting the joint 2012 Annual Meetings & Conference of the Agriculture, Food, and Human Values Society (AFHVS), the Association for the Study of Food and Society (ASFS), and the Society for Anthropology of Food and Nutrition (SAFN). For information about the conference, click here. For the meeting schedule and locations, click here. The conference is jointly sponsored by the New School and NYU. My talk is from 5:30-6:30 p.m. in the New School’s Tishman Auditorium. NYAM Author night: Why Calories Count: From Science to Politics. The Academy is at 1216 5th Avenue, at 103red Street. Admission is free but registration is needed (you can do that here). Registration starts at 6:00, and the presentation starts at 6:30 and ends at 7:30. Mal Nesheim and I are doing a talk on Why Calories Count at Omnivore Books, 3885 Cesar Chavez Street @ Church between 26th and 27th Streets, Noe Valley. It goes from 3:00 to 4:00 and is free and open to public. This is a talk on Why Calories Count at San Francisco’s Ferry Building. Book Passage is at #1. The talk is free and open to the public at noon. The topic: “How would Julia Child vote on the 2012 farm bill? 4:00 p.m., Fales Special Collections at Bobst Library. Open to public. Details are here. I will be doing the opening keynote at the book fair at 9:00 a.m. Where is it? Someplace in Williamsburg. Details to come. I’m on a panel at 4:00 p.m. about Dan Imhoff’s book about the 2012 farm bill: “Food Fight.” Details are here. The Fales Special Collections are on the 3rd floor of NYU’s Bobst Library. Keynote plenary on public health nutrition for the 21st century, Rio de Janeiro State University, 2:30-4:00 p.m. I will also be doing a panel that afternoon and another talk on the 29th. Information is here.Information on World Nutrition Rio 2012 is here. Mal Nesheim and I will be reading from and signing copies of Why Calories Count: From Science to Politics, at Ithaca’ community-owned bookstore, Buffalo Street Books, 215 North Cayuga in the DeWitt Mall, 2:00 p.m.
Buffalo Street Books is Ithaca’s Community-Owned Cooperative Bookstore. Onstage conversation with Dr. Daphne Miller on “we are what we eat,” 7:00 p.m. Norton Center for the Arts. I will be speaking about Why Calories Count: From Science to Politics at the new NYU Bookstore at 726 Broadway @Waverly, 6:30-8:00 p.m.
A talk on Why Calories Count: From Science to Politics, Fales Special Collections at Bobst Library, 3rd floor, 4:00 p.m. Open to public. I will be speaking about “Why Calories Count: From Science to Politics” at this breakfast meeting of NYU student affairs personnel. The breakfast will be at the Wasserman Center for Career Development’s Presentation Room A, 2nd floor of 133 East 13th Street (Palladium Residence Hall, between 3rd & 4th Ave). This will be interview with Melissa Clark of the New York Times, Millenium Broadway, 145 West 44th St, Hudson Theater, 1:30-3:30 p.m.
NYU College of Arts and Sciences undergraduate Women in Science scholars and NYU Women in Science are the sponsors of this annual lecture. 6-8 p.m. Jurow Hall/Silverstein Lounge in the Silver building, on Why Calories Count: From Science to Politics. University of Wisconsin, Whitewater, lecture, Young auditorium, 7:00 p.m. Public health nutrition: where we are now. The conference runs from 8:30 – 5:30. My keynote is at 3:30. Here’s the conference flier. This is the inaugural student-organized Joyce Lindower Wolitzer ’76 and Steven Wolitzer Nutrition Seminar, 4:30-5:30 p.m., room G71 MVR Hall, followed by a reception. This will be the first talk on the new book, Why Calories Count: From Science to Politics. For further information, see poster. For the talk itself, go to http://www.cornell.edu/video/?videoID=1968 . New York: NGO Working Group on Food and Hunger, U.N.
Policy lunch talk in the series “the future of global food policy,” UN church Centre, 777 UN Plaza @44th St and 1st Ave, 1:00-2:45. The talk is open to the public with RSVP only by 3:00 on February 14 at rsvp@globalpolicy.org (this is to make sure they have enough food and seats). Lecture to Willard community, 7:00 p.m. Kiggens auditorium: food sustainability. Lecture on “food politics: implications for France,” 9:45-10:30 a.m., French Cultural Services, 972 5th Ave, ata French Embassy Workshop on French and American Perspectives on Food and Health. For information about attendance and schedule, send e-mail to florence.barnier@diplomatie.gouv.fr or telephone 212-439-1463. Third International Forum on Food and Nutrition. Bocconi University Conference Hall, Via Sarfatti 25, Milan. Workshop panel, 2:30-4:15. For information, see www.barillacfn.com. The conference is live-streamed. Panelists, besides me, include Nathan Myhrvold, Andre Soltner, Dave Arnold, Johnny Iuzzini, Wylie Dufresne. International Culinary Center, 462 Broadway, 6:30 p.m. for the panel, followed by a reception. For information: modernistcuisine@intlculcenter.com. A food-focused summit will explore how sustainability impacts what and how we eat, from the growing and harvesting of ingredients to the processing, packaging, distribution, retailing, cooking, and consumption of food. Summit speakers include Marion Nestle, Carolyn Steel, Joel Salatin, Marcus Samuelsson, Magnus Nilsson, Tim Zagat, and Swedish Minister for Rural Affairs Eskil Erlandsson. Consumer Reports moderates a discussion with Marion Nestle, William Neuman, and Bill Marler. Click here for more information on this event, and to see the full Consumer Reports 75th anniversary celebration schedule. Panel discussion as part of Critical Topics Series. 4:00 p.m., Bobst Library 3rd floor. This World Food Day’s talk on Sunday is titled “The overt and covert costs of food: economic, social, ethical, and health dimensions.” It’s from 2:30 to 6:00 pm at Hopkinson House, 32nd floor, 604 south Washington Square, Philadelphia. Other speakers are on genetic engineering and the promise of SPIN farming. This will be a noon lecture, open to public. Details to follow. My lecture is at 7:00 p.m. It is part of a series on Food Production, Consumption, and Security. Open to public on the Lethbridge campus. This is a lecture in a Letters and Science/Journalism 101 course on The Rise and Future of the Food Movement. 6:00 p.m. Wheeler Auditorium, UC Berkeley. Open to public but reservations needed. I’m doing an “Encounter with the expert: Current conflicts in public health nutrition: the role of the food industry.” 3:00-5:00 p.m., Parc Cientific de Barcelona, Baldiri Reixac 4-8, Torre 1, 3rd floor, sala 4. Open to public. Sponsor: The Centre Catala de la Nutricio. I’m giving the second plenary talk at 9:30 to 10:15 a.m. at the Hyatt Regency, Embarcadero. The conference runs May 9-11 and is sold out. Registered participants only. I’m on a panel on health and nutrition at the Washington Post’s conference on the Future of Food at Georgetown University, Gaston Hall, 37th and O Street NW, 9:00 to 4:30. Free to public. Earth Day panel on “Earth to Table / Table to Earth.” It’s at the Chelsea Market, 75 9th Ave, 2:30-4:00, at the James Beard pop-up restaurant. Michel Nischan and Karen Karp are also on the panel, chaired by Mitchell Davis. My talk is on “The Politics of Childhood Nutrition: How the Food Environment Undermines Healthy Food Choices.” It is sponsored by Commonground, a group representing parents of children attending several independent schools in the Princeton area. 7:30 p.m. Open to public. I am giving a lecutre on “food politics, nutrition, and sustainable food production” at 4:30 pm, at the Campus Center as the final lecture in a year-long series on “The Hungry Mind.” Open to public. I am the 2011 recipient of the National Public Health Hero Award given by the UC Berkeley School of Public Health, and will make brief remarks. Yerba Buena Center for the Arts, 6:00 reception. I’m on a panel at 4:00. Details to come. Mal Nesheim and I are discussing our book, Feed Your Pet Right, at Cornell’s Mann Library at 4:00. Open to the public. This is a talk at a symposium in honor of the retirement of Martijn Katan on “Evidence-based nutrition: When is evidence proof?” My talk is on “The politics of evidence-based nutrition.” This will be at the Vrije Universiteit, Amsterdam, beginning at 11:30 am. Panel: Pam Koch, Marion Nestle, Fabio Parasecoli, William Solecki, Mark Gregory Robson, Jaime Stein. This is a keynote presentation at 8:15 a.m. to a conference: “Beyond Sugar: Contemporary Nutrition in Pediatric, Oral, and Systemic Health.” Open to registered participants. Details are here. I will be giving a short presentation at this annual meeting of the awkwardly named “Private and Public, Scientific, Academic, and Consumer Food Policy Committee” at the JF Kennedy School. My seriously glamorous virtual avatar is being interviewed by Jay Ackroyd tonight at 9:00 p.m. EST on Second Life. We are talking about food politics and food safety, among other topics, and you can tune in and listen on blog talk radio. This is a panel on the “politics of food and health care” with David Kessler and Ruth Reichl. I will keynote the annual conference at the Rochester Convention Center at 5:15. Open to registered participants. This event is for the Berkeley student co-ops, where I lived when I was a student. The event is called “Navigating food choices in today’s economy: a dialogue with Marion Nestle and Narsai David.” 7:00 p.m. The David Brower Center, 2150 Allston Way. Reservations at www.bscaa.org/foodchoices. This will be a lecture on “Food Politics: Advocacy for Social Change” as part of a University of Washington course on Eating the Environment. Open to the public. 6:30-8:00 p.m. Kane 120. Here are FoodSafetyNews notes on what I said, and some from Judy Lightfoot. Conference on “the precarious alliance: strengthening human networks and natural systems.” Information and registration. My hour-long talk is at around 10:00 a.m., on food issues related to climate change. The Nobel Conference on “Making Food Good.” My talk is posted online. Excerpts are posted on the Edible Communities site. The New York Culinary Experience, sponsored by the French Culinary Institute and New York Magazine. Lunchtime Q and A.
I am giving the Peggy Friedman Memorial Annual Social Justice Public Lecture at Piscataway High School. 7:00 p.m. Open to the public. Public Health Grand Rounds at SUNY-Upstate Medical University’s Department of Public Health and Preventive Medicine, co-sponsored with the College of Human Ecology at Syracuse University. Title: “Public Health Nutrition in the Obama Era: Key to the Food Revolution.” 4:00 p.m. 2231 Weiskotten Hall, Irving Ave.
Linfield Convocations address, 4 p.m., Ted Wilson Gymnasium, on the Politics of Food. I’m giving a couple of lectures and seminars at this event at various times during the July 4th weekend. Registered participants only, alas. In honor of the opening of NYU’s new bookstore space at 726 Broadway, I will talk about my books about food politics at 7:00 p.m.
New York: What’s Organic About Organic? I’m participating in a panel after a showing of the new film, “What’s Organic About Organic?” The film previews June 21-25 at 7:00 p.m., and June 26 and 27 at 2:00 and 7:00 p.m. Tickets are $10 except June 25, which is a fundraiser for NOFA. HERE Theater, 145 6th Ave. I am receiving Bard College’s John Dewey Award for Distinguished Public Service at commencement exercises for graduates of the Bard Prison Initiative (BPI). According to the BPI Wikipedia entry, the program offers a liberal arts degree to incarcerated individuals in five different prisons in New York state. It enrolls nearly 200 students and is one of the few degree-granting programs that exists since the government eliminated funding for prison education in 1995. Mal Nesheim and I will be talking about Feed Your Pet Right at the Fales special collections section of NYU’s Bobst Library (3rd floor), at 4:00. Click here for the invitation and details. Mal Nesheim and I are doing a reading of Feed Your Pet Right at 3:00 at the Point Reyes Bookstore. I’m not sure about the location (Toby’s Feed Barn? ), but the bookstore is at 11315 State Route 1, in Point Reyes Station and the store’s phone number is 415.663.1542. My lecture is the first in a “Food for Thought” series of lectures by people who write terrific books about food and food issues. I wish I could go to all of them. Mal Nesheim and I are doing a reading of Feed Your Pet Right at 3:00 p.m. This antiquarian and collectible cookbook store–worth a visit on its own–is at 3885 Cesar Chavez Street, at Church. Sustainable Food Institute on future of food, closing keynote, 3:30 p.m. This is an invitational event that is not open to the public. Mal Nesheim and I are talking about our new book, “Feed Your Pet Right,” at Holistic Hound, a nifty pet store at 1510 Walnut (near Vine) in Berkeley (we wrote the chapter on organic pet food based on products from this store). This will be at 6:30 p.m. Free and open to the public. I’ll be speaking at a private salon that is open to the public. The series is in honor of Cyril Patrick Shaughnessy, Jr. It is free but requires rsvp. To rsvp, go to cpslectures.com. Click on “invite me.” This will trigger an e-mail and, later, an e-vite with details about where and when. My presentation, on “Food Politics, Pet Food Politics, and Today’s Healthcare Mess,” is at 8:00 p.m. This is the 2010 Edward and Nancy Dodge Lecture at the Johns Hopkins Bloomberg School of Public Health, sponsored by the Center for a Livable Future. 12:00 to 1:30 p.m. Details at the Center’s website. Open to public. I am being honored by Eating Liberally, Saturday, May 1st – 7-11 pm, at their annual celebration. It’s at the DCTV Firehouse – 87 Lafayette between Walker and White – in Lower Manhattan. “Support the work of Living Liberally in over 300 cities, and toast our honorees: Dr. Marion Nestle for her leadership in improving our diets and the world and the labor powerhouse SEIU for its support of a progressive America.” For information and tickets, click here. This is a moderated panel discussion with Prof. Paul Argenti and others on the subject of the film, Food, Inc. The film will be shown in Georgiopolis at the Tuck School at 4:30 and the panel discussion is at 6:30. Open to public. The lecture is sponsored by the Women’s Health Advisory Council of Lake Forest Hospital. It is from 9:30 to 11:30 a.m. and includes a book signing. Location: the Gorton Community Center, 400 East Illinois Road, Lake Forest. Open to public. For information and registration, click here. Talk on the forthcoming pet food book–“An Outsiders’ View”–at the annual Pet Food Industry Forum, afternoon. Open to meeting registrants only. Presentation to the Committee on Front-of-Pack Labeling, 1:30 p.m., at the National Academy of Sciences, 2101 Constitution Ave.
Clark Wolf is moderating one of his Critical Topics panels at the Fales Library (Bobst, 3rd Floor) from 4:00 to 6:00 p.m. Hear Frank Bruni, Scott Hocker, Krishnendu Ray, and me discuss how we are talking and writing about food in the new media world. Open to the public. Georgetown University Library Associates, 6:00 p.m.
Knight Science Journalism Program (participants only). Cornell Institute of Public Affairs, colloquium series, 4:30 p.m. 233 Plant Sciences on “The food revolution: implications for public policy.” Free and open to the public. Graduate Field of Nutrition seminar, 100 Savage Hall, 4:00 p.m. on “Food politics: has the food revolution reached Washington?” Free and open to the public. This lecture is rescheduled from February 10 (snow emergency). Arts and Sciences spring Theme program on sustainability. Lecture: “What to Eat: Food, Politics, and Sustainability.” 1:00 p.m. Science Building room S-100. Nutrition Awareness Month lecture, keynote speaker, evening lecture, 7:00 p.m.
A lecture to first-year students in the course on Physician, Patient, and Society on the politics of obesity, 9:00 a.m. This is for the 100th anniversary of the USDA’s Economic Research Service. The event runs from 2:00 to 3:30 at 1800 M Street, NW, Waugh Auditorium. I’m lecturing on food politics at 10:50 a.m. at Jazz at Lincoln Center. For information. This is for the Louisiana State University School of Public Health and marketumbrella.org. Details to be arranged for the 18th and 19th. Girls’ Night Out, on What to Eat. 6:30 p.m. Open to public. This event has caused quite a stir, apparently. Science magazine had a snarky little piece on it (scroll down to lower left) sniffing that “girls” must not be interested in real science given the lineup of speakers. I wrote an equally sniffy rebuttal (go to the second page). Enjoy! This is a panel discussion from 1:45 to 3:15 on the future of academic food writing. Information about registration is here. Lecture on the theme of sustainability and the American food system. Cancelled due to expected snow. Rescheduled for March 11. Global Food Safety Conference, 2010, JW Marriott, Washington, DC. My talk is at 2:00 p.m. Information is here. Registered participants only. This is a talk on the forthcoming book on pet food to staff of the FDA’s Center for Veterinary Medicine (by invitation), at the FDA offices in Silver Spring, MD. Early afternoon. Manhattan Borough President Scott Stringer and his staff, along with Just Food and NYU, have organized this upcoming conference, this one on climate change. Details are on the conference website. Admission is free. It runs from 8:30 AM – 5:00 PM, at NYU’s Skirball Center for the Performing Arts, 566 LaGuardia Place at 4th Street. Call 212-669-2094 for more information. My talk is in the morning. I will be speaking about my work at this meeting of the NYU Society of Fellows at the Torch Club, 6:00-9:00 (members only). This is part of the Behind the Book: A Visiting Author program that encourages authors to talk to high school students. 1:45-3:15 p.m. in the class run by Ray Pultinas, who is organizing an activism conference focused on food. This meeting is held in conjunction with the Westchester Cat Show at the Westchester County Center in White Plains. My talk will be in the afternoon. Schedules and conference information are posted on the Cat Writers’ website. This will be a panel discussion at the New School, Theresa Lang Student Center, 55 W. 13th St. Other panel members are Peter Pringle, Brian Walsh, and Bob Goodman. I’m doing a panel at a fundraising luncheon for the NRDC, 12:00 to 2:00, place and other panel members to be determined. This will be a keynote presentation on the politics of food safety at 2:00 p.m. at the main stage at the San Francisco Concourse and Gift Center, 635 8th St.
I’m speaking to Michael Pollan’s journalism class about food politics. This is a lecture during Challenge Week 2009, with the theme Just Food: Farm-to-Fork Food Systems for the 21st Century. My talk is at 7:00 p.m. Other speakers during the series, which runs from November 5 to November 12, are Joel Berg, Chris Taylor, Woody Tasch, and Joel Salatin. Here are the details. This is a panel celebrating members of the James Beard Foundation’s Who’s Who. Fales Library (Bobst Library 3rd floor), 4:00 p.m. This conference, sponsored by the Institute on Medicine as a Profession at Columbia University, is about what can be learned by comparing experiences from tobacco, alcohol, food, and pharmaceuticals. My talk is from 10:00 to 10:20 a.m. Location: Irving Institute Conference Room, 622 W. 168th St, PH-10-204 (10th floor) in the Presbyterian Hospital Building. The conference runs for two days, November 2 and 3. Details are here. New York: Gourmet Institute’s How to Eat panel: CANCELLED! This was to be a panel discussion moderated by WNYC Radio Host Leonard Lopate, to kick off this year’s Gourmet Institute. It was to include Ruth Reichl, Editor-in-chief, Gourmet (now former), Barry Estabrook, Politics of the Plate contributor, Kim Severson, Food Writer, The New York Times, Josh Viertel, President, Slow Food USA, and Lorraine Bracco, Actress/Winemaker, Bracco Wines. Along with the demise of Gourmet magazine, this got cancelled too. Alas. This is the 6th annual George McGovern lecture in the Green Room at FAO at 2:30 p.m.
Lecture to students and faculty of the Master’s Program in Human Development and Food Security, Roma Tre University, 3:00 p.m. This is to UN nutrition professionals at FAO from 10:00 a.m. to noon. Lecture at a Hypertension Symposium, Pacific Palms Resort, Industry Hills. The program is sponsored by Southern California Permanente Medical Group and is offered for continuing education credit for doctors and nurses. My talk, “sodium restriction: a public health imperative,” is at 11:30 a.m.
I’m giving the Saturday night keynote at Food for Thought, Time for Action: Sustainable Food, Farming, and Fisheries for the 21st Century, College of the Atlantic, Bar Harbor, Maine, 7:30 p.m.
I’m speaking at the grand opening of the new Fair Food stand at this indoor market. Fair Food brings in produce from local farmers and works with farmers to market their products. 10:30 a.m. for the press conference. The Bruno Kreisky Forum for International Dialogue and the U.S. Embassy, keynote. The Forum was founded in 1991 in commemoration of the late Austrian Chancellor Bruno Kreisky. A group of Kreisky’s friends and colleagues created the Forum to continue Kreisky’s work for Human Rights, the Middle Eastern Peace Process, Europe after the Cold War, and other issues close to him. This year’s lecture series can be found here. Dinner and talk, probably 7:30 p.m. This talk is to keynote the Global Conference on Meeting Nutritional Challenges with Sustainability and Equity, August 2-3, India International Centre (Annexe). The meeting is organized by IBFAN (International Baby Feeding Action Network), Navdanya, IHES (Initiative for Health, Equity, and Society) and BPNI (Breastfeeding Promotion Network of India). It starts at 8:30 a.m. on August 2. My talk is at 9:40. University of Alaska Fairbanks Summer Sessions, Schaibel Auditorium, Bunnell Building, 7:00 p.m.
Panel on “ingredient for success in turbulent times #6: engaged people.” Waldorf-Astoria Hotel, 11:00 a.m. This one was videotaped. And here’s Refresh blog’s Bob Vosburgh with some notes on the talk. I’m speaking at an organizing event for Corporate Accountability International (formerly Infact). Here’s the e-vite where you can find out about it and RSVP. This will be a talk on food safety to members of Stop Tables Our Priority at a fundraiser in Brooklyn (see invitation), 7:00 p.m.
William J. Clinton Distinguished Lecture, Clinton School of Public Service, Library, Sturgis Hall, 6:00 p.m. Annual Meeting, W Hotel, Union Square, 201 Park Ave South at 17th St, Great Room, 5:00 p.m.
Young Lions Committee presents Eating at Home with Rocco Dispirito, Julie Powell, and me in conversation with Amanda Hesser. Reception 7:00 p.m. Program 8:00 p.m. This is a lecture to the York College (CUNY) – FDA Collaboration, Provost Excellence Lecture Series, at noon, York College Academic Core Building, Guy Brewer Road, Jamaica, Queens. It is open to the public. Conference on “Import safety: regulatory governance in the global economy,” Penn Program on Regulation, opening dinner, Inn at Penn, 6:30, keynote speech. In Search of Real Food (with Michael Pollan), Landmark Theater, 6 North Laurel, 8:00 p.m. Currently sold out, but call 804-330-3993 for availability. This is the lecture that got snowed out on March 2. It’s at 1:00 in Spiro Hall, Room 2 (here’s the old announcement). Pennsylvania State University, Rock Ethics Institute annual Lippen lecture, 7:00 p.m. Lobby Talks PBS program, 7:00 p.m.
MIT Knight Science Journalism Fellowship program, MIT Faculty Club 9:00 a.m.
I’m speaking at Wagner College, Staten Island, at 1:00 on Monday, March 2, Spiro Hall, Room 2 (unless it is snowed out, of course). Here’s the Wagner announcement. It was indeed snowed out and will be rescheduled for some time in April. At 9:00 p.m. I’m bravely doing another Second Life interview. Take a look at my classy avatar! To see upcoming appearances, click here.